I was working on my Mac when my iPad sounded a push alert. I checked to see which app was sending me an important, urgent message. 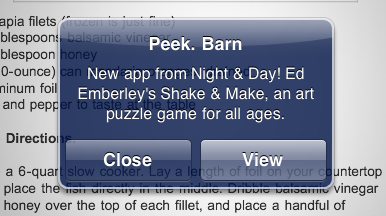 The alert, I discovered, came from Peekaboo Barn, an app from developer Night & Day that I bought for my kids last year. I’d never received a push alert for Peekaboo Barn before—I didn’t even remember that the app supported push alerts; it’s an app where animals appear and make their standard animal sounds. What would Peekaboo Barn need to push—that the cow says moo? An alert that a new app is available in the App Store probably doesn’t merit a push notification. That alert really frosted my flakes. I want push alerts to convey updates that are important to me, on information I’ve requested—breaking news, or when it’s my turn to go in Words With Friends, or when someone sends me a direct message on Twitter. I grant you that the fact that it’s my turn in a Scrabble knockoff isn’t hugely important in the grand scheme of things, but it’s important to me. That a developer has released a new app and would like me to buy it isn’t an alert I signed up for: It’s an ad. Worse, it’s an unsolicited ad that interrupts me when the app I did purchase isn’t even running. To me, such behavior is hostile to customers. And unfortunately, there’s a surprising amount of customer-hostile behavior lurking around the App Store—often hiding around in some wonderful apps. The developer for Par Out Golf would like you to rate it in the App Store—and will ask you to do so repeatedly. Perhaps the most obvious example of egregious developer behavior is the desperate plea to be loved. Far too many apps seek your public praise with in-app alerts asking you to take a moment to review the app on the App Store. Of course, doing so interrupts your flow and would require that you exit the app completely. If I like an app enough—or dislike one enough—I’ll write a review without further prompting. I understand completely that iOS developers’ success is tied directly to App Store performance, and that higher app ratings can significantly boost sales. But apps that beg for reviews are focused on their developers’ needs, and not mine. If I stuck a bag of popcorn in my microwave, and before I could hit the Start button, my microwave prompted me to write up a few sentences about how nicely it heats up food, I’d be similarly annoyed. When a developer interrupts me within an app for that developer’s benefit, it’s rude. Sometimes, interruptions are part of the deal you make when you install an app. For example, while I paid for Words With Friends on the iPad, I use the free, ad-supported version on my iPhone. And in the ad-supported edition of that game, you see an ad after every single turn you take. 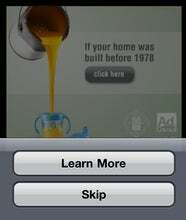 The ad takes over the entire iPhone screen. Again, I can accept this behavior—it’s the price you pay for not upgrading to the paid version of the app. Watching ads is one thing; having to tap to dismiss an ad is another annoyance altogether. What I find harder to accept is the app’s insistence that you interact with certain ads; merely viewing them is apparently not enough. Once you’ve stared at these promotional messages long enough, you first tap a button to continue, and then must tap a second time, choosing between “Learn More” (or sometimes “Get Free App”) and “Skip.” I imagine a laughably small percentage of users choose to leave the app at that point—after not having tapped on the ad itself seconds prior—and that a laughably large percentage of those who do leave the app to check out the advertised item do so unintentionally. Requiring extra interaction with an ad seems excessive, and not at all customer-friendly. Developers can be tempted by the dark forces of advertising in other ways, too. Macworld previously reviewed some of Neon Play’s iOS games, and we noted then that more than one of the developer’s apps feature iAds that appear as you’re trying to navigate through a game’s menu, causing unintentional ad taps when you meant to tap elsewhere. The best developers know that their iOS apps will succeed based on goodwill and word-of-mouth from happy customers. When Twitter tacked an annoying QuickBar to the top of the app—a bar that could (and did) frequently display sponsored trends—users complained, loudly, and Twitter eventually removed the bar. Many, many great apps never stooped to any customer-hostile shenanigans, and I thank their developers—and heartily endorse their apps to my friends. As with any creator, iOS developers should feel good about the products they create. I’d throw away that hypothetical, endorsement-seeking microwave. And I’m starting to remove apps that focus more on what their developers want than what I do.